Available in packs of 50, Rexel 80x50mm Fasteners are the most popular fasteners in the world. Solid stainless steel, they are ideal for bundling perforated documents up to 8cm thick. 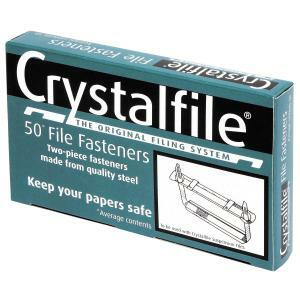 Crystalfile® 2 piece fasteners are made from quality steel. 80mm centre for standard punching and 50mm prongs for increased filing. Can be used with manilla folders or suspension files to keep papers neat and in place.